Mail between 2009 - 2011 * Could J.D. Mahama have something learned from? The e-mails below are messages, sent to John Dramani Mahama. All messages are of the time as Vice president of Ghana. Sir, I hope all is well with you. I want to find out why compensation for the property destroyed during the construction of the maamfe-pantang highway has still not been paid four years after completion. I'm a poultry farmer and i know you know first hand the crippling crisis poultry farmers are facing in this country so to have our warehouse and other buildings destroyed and to be still waiting for the compensation after 4 years has been quite difficult to say the least. We are down to a third of our workforce and capacity but because of our Ghanaian spirit we will continue to strive. We are not the only ones affected so Sir I'm writing to you in the hope that you might inquire from the Ministry of Roads and Highways and the Ministry of Finance about our plight. I know you are very busy but I know you also have your citizens best interest at heart. Thank you for your time and have a great day sir. Your excellency, I bow before you in salute! I wish you well and your family at large. I have been waiting for this opportunity to send to you my warmly greetings and the greetings from the people of Larabanga. Our prayers are with and your/our government, may the almighty Allah bless you, guide and protect you. I know you have so many duties and responsibilities you perform as our wonderful Vice Prez BUT this is a reminder to you, the people of Larabanga still waiting for the promise you made in 2008, when you made your campaign tour to the village. If you may remember, the water the people were drinking was just like mud I the Assembleman fetched the water for to see and you asked weather it was for animals or for people. I bow again in respect and love. good morning mr. VEEP, i have been trying all means possible to find a way by which i can meet either you or the veep personally to discuss some issues i hope would benefit all of us and help us all attain a ''better ghana'' we have all been dreaming of since the attainment of independence. i was very much happy when in the 2008 campaign season, you in one of his campaign messages said something about how this current administration was going to handle disabled people should the ndc come to power. in-fact for some of us we felt very happy that our prayers was coming to a realization. my daddy is a blindman;not that he became blind after he gave birth to me but has been blind before giving birth to me.growing up in life, i saw the difficulties my daddy had to go through in trying to make ends meet but thank God i have caring aunties who tried their very best to support their only brother. he told me he got blind in his early twenties as soon as he started training to become a mechanic. with the supporting family he has he was encouraged to move on in life and got himself enrolled in the akropong school for the blind, which he completed successfully and later got his vocational training in the rehabilitation center in accra. he was then absorbed into the ghana education service where he taught as a craft instructor. your excellency, he further went on to tell me that he gradually was rising through the ranks when all of a sudden his promotions was halted and was only taking home monthly salary that only got better when there was an increase in minimum wage.he has been very committed to his work and would want to go to school to go and teach just to contribute his quota to national development. you and would wish you stand for the presidency in 2016 without any fear of the Rawlings.They are a disgrace to the NDC,you will floor her if she attempts to stand again in 2016. Your boss prof. has giving you enoungh training. Almighty Allah is seriously guiding you and the good old prof.You are my mentor. I have all my names correspond to yours but I changed my surname to reflect my religiou believe. However, i encourage you to look at the problems in the Gonja areas too. Plse forgive me if you think i sound tribalistic its not the intention. I only want you to get a strong support of your kinsmen.Also Radio and TV receptions are so poor in the Gonja areas. They are restrict on only one station, GTV and unique. Thank you for your call .How did you get my number? Or is it some one impersonating you? Can you please spare a moment to call me and confirm. your excellency, i am very honoured to have you as my second best man in this dear country of ours. your excellency, i have seen all the effort of this current administration to make the agricultural sector of the economy attractive, especially to the graduands youth of the country. am talking as a young graduate from one of the tertiary institutions in the land who decides to go into aqua culture with about 6000 spices of cuttfish from self financing source.but your excellency i stand to be corrected, most of your (government) polices is to provide grants and other forms of financial assistance to the youth to start or expand their aqua farming, but who buys the end product from the farmers?,at what price?, and who determined the price?. we would be more productive when we are also, given a similar platform to sell our product to the government at a standard price like those in the cocoa,sheanut,coffee and so on industries. this would take away the buyer determine the price for the fish farmer as result of non-availability of market.Unlike those on the other hands of agriculture, we do not get subsiduce on our inputs like the feed which is about GH40.00 per a bag. Your excellency, your respond would give us a life line. Thank you, our 2016 president (prophecy). HI, MR MAHAMA I,M WORRIED ABOUT WHAT IS GOING ON IN THE PART CONCERNING THE ISSUE OF FORMER PRESIDENT, J.J AND SITTING PRESIDENT.PLEASE,I WANT PROF MILLS TO CALL THE FAMILY OF FORMER PRESIDENT TO SOLVE THE PROBLEMS IN THE PARTY TO BRING PEACE AND UNITY IN THE PARTY.IF THIS IS NOT DONE, WE ARE GOING TO LOSE IN 2012 ELECTION.PLEASE I WAS BORN INTO THE PARTY BUT NOT JOIN SO COMING INTO POWER IS MY PRIORITY.THANK YOU FOR YOUR CONCERN. My dear Vice President,my name is Joseph Asafo Adjei a civil engineer.Over some years now,we all people living in Ghana have realised that most of the accidents caused on our roads,are been caused by faulty cars and trucks which drivers somtimes park them at very rong places,and due to their bad driving atitudes innocent lives are been taking and most at times its parents that go through this trumor and thier children are been left on theese earth to face the strong winds of the real world. Recently i heard in the news that,the police are now going to enforce drivers to drive along with the warnig triangles and reflectives all the time. But Mr Vice President,between you and me we know very well that there is no way the police can do this efectivly and more over most drivers will not leave thier warning triangles on thier cars for overnnight because of the fear that it would be stolen since it was baught with their hard earned cash.So left to me alone,i suggest that we creat a body under the govrnment that will check cars and trucks that distructs traffic on the road. And these cars and trucks will be towed to the nearest police station meaning an office will be created in all police stations across the nation for these traffic offenders,and the offenders will be fined a fee to pay.In other for the body not to be corrupted,they will be paid from the coffex where we keep the fine taking from the offenders of the law and also part will be paid into the governments coffex for developmental projects. And since the government is involveld we can seek for trucks that can towe all kinds of trucks and cars in our country which will be paid in bits as we work effectivly.with these vehicles users will take the routine check up on this. Mr Vice president, my concern is on our EDUCATION system for the technical and the vocational schools graduate. After graduating from a vocational school. one has pursue to the polytechnic but can not pursue to the UNIVERSITY like when one graduate from the senior high school. We do not have any UNIVERSITY for the vocational and Technical school graduate which is not fair to us the Vocational and technical school graduate. Is like we have been neglected from the education policy of Ghana. We also want to pursue to the university after completing vocational school. With the better Ghana agenda, I think we also have to be considered. HI,am very grateful with the Bole senior high school ICT LAB which has just being commissioned by H.E THE VICE PRESIDENT OF THE REPUBLIC OF GHANA JOHN DRAMANI MAHAMA. My dear VP This is to wish you Merry Xmas & avery brightful 2011 with a lot of success. My name is Baba-Sofo Mohammed from Prang currently living in Kaduna in Nigeria. Have a successful political future. In fact if you come there with this your presidential convoyed this truth will never be found and slowly and soon it will bring your government down believe it or NOT. My the Almighty Allah grant you more of the courage, strength, love, sympathy, dedication and perseverance you have shown so far. I am really proud of you and my N D C party. I believe every patriotic and dedicated party member should think of what he/she can do for the party and the country at large but not the other way round. I was a polling agent during the 2008 general elections and i will continue to stand by you. Keep the good work and Allah will bless you. Hi veep, my mother's name is Christine Atuspi Tudzi and my Uncles are Billi Wisdom and Mark Negedu. I will be seventeen years on the 29th of November and my Uncles told me that is your date of birth too. Uncle shall we plan and celebrate it together or will u please invite me to join you when you are celebrating your birthday? I will be very much happy to join you celebrate it together. Am a final year science student at Chemu Senior High School. MR.VICE PRESIDENT,WE THANK YOU AND PRESS MILLS FOR DOING THIS GREAT JOB FOR THE NATION.WE ARE READY TO GIVE ALL THE MAXIMUM SUPPORT TO YOU AND THE PRESIDENT TO MOVE GHANA FORWARD.AM NOW READING HND MARKETING AT S.POLY, MY AIM IS TO BECOME THE NATIONAL YOUTH ORGANIZA OR PROPERGANDER SEC.AND I KNOW FOR SURE THAT THE PARTY HERE MY VOICE.N.D.C. IS MY REAL PARTY THAT I HAVE IN ALL MY LIFE. THANK YOU AND THE PRESIDENT FOR THE GOOD WORK DONE. i am in the North at the moment though i grow up in Accra but a norther from Bawku. i realised that the forest in the three northern region are been degraded all the time by burning expercially during the dry season. As part of the Youth Employment Policy if the youth in the north can be organised to form a task force, put cars at thire disposal to check the bush burning and to educate the people about the benefits of the forest it can serve as employment to over 10 thousand of the youth in the North. i see that the government is doing all it can to create afforestation by planting trees all over the place so the few we already have needs to be protected. i would also be glade if the Government will turn it attention to Mataheko (Accra Mataheko not Ada-Saga Mataheko area) roads. Since 1992 till date, the township has never seen any road rehabilitation works and is one of the oldest estates in ghana because is close to Dansoman. i grew up there. Hope my suggestion will be taken and put to use. May the peace of our Lord Jesus christ the love of God and the free fellowship of the Holy Spirit be with you forever and ever. Hi Vice president I think you have been doing well.But the market women in the oil City need your help. Please do mind to check your loans you have given out ? we are so proud of you. mine is very brief and has to do with the condition of our road network and the transport system as a whole. please do something about the millions of potholes and the never ending traffic in accra and the old vehicles must get off the roads. and for our youth, create some form of mass employment into various fields to curb the crime rate in the country. all the best and we are full force behind you. God bless you ,God bless Ghana. I wish to appeal for the petitions sent by Government of Ghana for the release of Mamoud Mustapha Abubakar. Mamoud Mustapha Abubakar is a native of Ghana but resides in Lybia. he was arrested concerning a case of killing in which he was not a victim. His arrest occurred on 1st October 2004 by the Lybian Government. Later he was then sent to Kafia Prisons located in the city of Ben - Gazi till date in the deemed prison. In March 2008, a petition of pardon was sent to the Lybian Government by Ghana Government and the decease family in Sunyani for his released. A permission was granted to do so as stated in the petition. Please Sir, since then Mamoud Mustapha Abubakar haven't been released by the Lybian Government. Therefore as a concern citizen who is aware of his arrest and even sometimes host him on air during my phone in talk programme is appealing to you for a re - petition to the Lybian government, so that he will be released and deport to Ghana. Your excellency the vice president may God bless you for the good works you are doing. Please I would like to know where you worship. His Execellency, I have been looking for an opportunity to congratulate you and get in touch for sometime now.I am happy and grateful for what God is doing in your life.We as a country are blessed to have such a humble person like you as the Veep. Keep it up. I will bear you in my prayers always. My humble advice to you is to keep focus and do not be distracted by critics and the good Lord will bring to pass his purpose in your life.I will appreciate it, if you have some time to spare. I tried calling but to no avail. The number above is my contact. God continue to bless and keep you safe. Honourable vice president, i greet you with the peace of the most high and his grace that has kept us going day after day. i have longed for a platform like this to express some worries and i believe it is also by the same grace that helped me find this site. i am in kumasi at the moment and just completed shs.i have actually gained admission into one of the countries universities. sometimes i ponder on the direction of our basic schools and dont find anything worthy about it. at the moment in kumasi, education is based on the money you have because, the pupils in the government schools are not given any good foundation. therefore to enable your child get a good foundation he or she have to attend a private school. in my house at the moment, there is a 14 years old girl who came from nyinahini, one of the towns surrounding kumasi. she was about entering primary six and could not even spell the word: six. in fact she was admitted into class three here in kumasi. i believe that since all those who did not pass very well are those admitted into our teacher training colleges, this problem will continue to increase, untill those who really have the desire to teach are given the mandate to do so. thank you very much for your time. My name is Terry Van Dien and I am the CEO of Dragonfly Industries Africa Ltd. I have been working with Mr. Ahmed Shams, your Personal Advisor and wish to tell you how much I appreciate all his help in moving our BioFuel Feedstock project forward. We anticipate with all the project we are working developing in Accra and the other Regions of Ghana Dragonfly Industries will be employing more than 1500 people throughout Ghana. You should be very proud to have a man with his integrity and vision on your staff. It affords me much joy to mail this message to you. This is all about the institution NDC set up;thus UDS. The school as it was established was to improve upon the educational standard in the North and for that matter Ghana as a whole. Coping with this, the school has now turned into a GOLD MINING CENTER where we the students are the Gold and the managements of the school are the diggers of the gold. This situation is much serious especially in the WA Campus where we constitute the majority of the population in the entire university where fees paid are high from time immemorial but yet no developmental project is seen. Monies paid are reserved for self interest and not for the interest of the entire university. Your excellency Jnr John as i would like to call u. No wonder people are saying good things about you. Its never a suprise to me b'cos i know you personal,keep it up the good works. Thank God for putting you under another wonderful man President Snr John,there's a lot for you to learn to be a great leader that Ghana wants you to be. Working under the 1st and 3rd John for the NDC and tha 2nd John for NPP as an MP and also giving advice to then government on tv with Hon Nana Akomea,another gentle man like you. May the good Lord be with you. Mr Mahama what plans did you have for we the youth at Bole Bamboi, who have addimission university and cannot afford to pay. Hi, congratulations on your election as veep of the republic of Ghana. We are very proud of you. Veep, looking at Bole Senior High School you would realise that the school lacks a lot of infrasture in terms of classrooms, dormitories, water, teachers bunglows etc to mention but a few. We are looking up to you to atleast do something to reduce the plight of both teachers and students in the schoool. As a teacher, there was a day i decided to take a walk round the school. in fact i was overwhelmed by what i saw at the dormitories as students' boxes and bags were left to the mercy of the weather and thieves. Another area of concern is the Fufulso - Sawla road. if you are not able to work on this road before election 2010, i dont think you will blame your people if they refuse your plea. Veep, we axpect you to do something for us before your first term of office ends. WE LOVE AND ARE PROUD OF YOU. Hi sir veep, i am very happy that you are from northern region and i know every body from the north will understand the poverty level in the north. especially NAVRONGO IN THE UPPER EAST REGION please do something to help this youth, because they are burden to the country. Hi hon. vice presidet. i am touched by the way you talk. how i wishe that you become the president after prez. mills" term. mamny have starded seeing the prsidential already in you. go all out and prove your. please you made a promis to Wesley colllge of eduation when you came to inaugutrate the TEIN branch of the NDC that you will see to it that our SCIENCE LABORATORY is completed. But we have not heard any thing from you.please come to our aid as soon as practicable. thank you and may the lord bless and keep you strong and healthy. Hi Your Excellency,Every position has its peculiar challenges;yours is not exceptional. Sir,with prayers,perseverance and tenacity you can surmount all your challenges in life. Veep,i would be very grateful of you if you could get investors to revive the defunct underground mines at prestea in the Western Region because the defunct underground mines had been the mainstay of Prestea. Veep, the indigenes in Prestea are starving so use your high office to salvage us.Stay blessed. My veep, you are doing a great job for this country and i hope you are going to succeed in your political career, as it is left with one step to climb on top of the political ladder of this country. Work without fear or favour and you will make it. I would like to make a simple request. In light of the recent discovery of oil in Ghana. I think this is not just an opportunity for money, but a chance for Ghana to turn a new page for the rest of Africa. Let Ghana seek advise from countries who have our best interest at heart. This may be those who are willing to build oil refineries in Ghana, employ Ghanaian and develop our county: Our infrastructure, roads and water systems. We should realize how the developing world selfishly uses our riches to fatten themselves. We should dictate our own destiny. We are not second class citizens of the world, though some have made it appear that way. Let us take a stance to reclaim and direct our own destiny. God is Blessing Ghana! 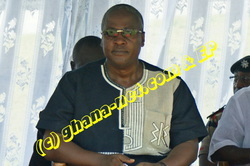 We could't have gotten a vice to suport the Prez than you, more grace to your elbow,God bless you and God bless Ghana. We from the Bole Traditional area are very proud of you. The truth is that, you have made Bole very popular on the Map of Ghana and no one can take that away from you. That in itself is a great achievement because we are all benefiting from that popularity especially when we travel outside Bole. We want to remind you of the Sawla-Fufulso road as a matter of urgency and serious concern.To us if this is achieved, you would be said to have solved all our problems. Most users of the road, natives of the area and Upper West people share this view with me. Though we know there are many national issues at stake, it is not out of place for us to put our plea before you. We are also needy.Please come to our aid. We are suffering. The Bole Hippo and Eco-tourism centre also needs serious attention to save the endangered species of the hippos and other aquatic lives on the Black Volta as long as the Bui project is on-going. This provision was overlooked by the planners of the Bui project. The NGO working on the Hippo project is very disturbed about this development and we wish this can be used as a platform to appeal to the planners to come to the aid of the NGO to continue the project.The Hippo species are endangered and if care is not taking, the Bui dam construction will finish them. May God take you further than where you are and may your dreams come true. I thank the God almighty for his benevolence he has given to we the people of Bole-Bamboi. Hon. John Mahama, I am very much excited for u becoming vice president of Ghana. It is my prayer that u would used your good office to help break the gap b/n the south and the north, and also our Bole-Bamboi as well. Hon.John Mahama, I wish u all the best and below here I want u to Read psalms 91:16. I know u are a very faithful man. Thank u I am from Teselima but stay in Accra here with u. Thank God for the work you are doing to help ghanaian people. may God continue to give you the wisdom to deal with problems that comes your way.I was very happy when you give the chrismas message, i think that was huge.I live in the states and it is very rare that one sees a concern official like you.please keep up the good work.I am waiting for your presidency. l thank god for good things that he has done to Ghanaian by giving us H.E.John Mahama as the vice President to Prof,John Evans Mills of N.D.C party. l urge him to continue to humble himself God be with him always.Thanks very much. Hello Mr. Vice president, May the Lord Almighty protect you from all wicked people and your enemies. You are my mentor I just want to be like you. God bless you and keep you save. well done your excellence.uyou are my role model i would like to meet you one day. and no doubt you are the next preident of ghana. I congratulate you on your assumption to the office of the vice president of the republic.Mr.vice president , i would like to use this opportunity especially on your birthday to urge you to push real hard for the implementation of the northern development project.I strongly believe this would go a long way to alleviate the poverty level in the north.May the good Lord bless your family and the republic of Ghana. Once again happy belated birthday. congratulate you your excellency for your honorable position.Your profile is much admiring and i personally like you because of your leadership skills which motivate people who will like to possess your combination of personality and skills that makes others want to follow your direction. I believe this Government have great plans for Ghanaian if every body will contribute his/her quota in what endeavor they found themselves .Spending on research and development is vital to continued growth and prosperity both a company and for a country or world at large. Just to say good morning to you and wish you all the best of luck.Iam a native of Bole Zampe and working with Mofa Damongo.Currently Iam attending a short couse at Barneveld in the Netherlands on Poultry.May God richly bless you and guide you to fulfil your dreams for Mother GHANA. Your excellency, goodmorning and happy birthday to you,please keep the humility, hardwork, gentleness, and discipline you have all the time demonstrated for you are a role module to millions of Ghanaians. i have several times listened to people talk about you and what i observed is that alot of people like you, no matter their party affiliations so you see keep it up for you have a brighter chance in 2012. I congratulate you your excellency,am a person who really loves you,anytime you come on tele my husband will call me and said your boy friend is on telly,i admire your gentleness,calmness,i never knew your are a christian,no wonder,it shows on you,am not an NDC neither NPP am a ghanaian a good citizen who really is proud of her country,our prayers are with you that the good Lord will guide and protect you,He will give you wisdom from above to contribute your part to the country.May The Peace Of God That Passes All Understanding Be With You And Your Family,long life ghana long life Dr Mahama,God Bless You. l congratulate the vice president and pray that the good lord would guild him and make him grate leader for him to became the next president to come for the NDC Party. Accept my congratulations for assuming that high office. Any time I see you on TV your soft voice make me very delighted this is because you are very much experienced in anything you do. I pray for God's guidance to double your wisdom to to take Ghanaians out of the mess created before you assumed office. I have learnt you are a strong christian and that will make you stronger in your endeavors.The majority of Ghanaians are solidly behind you and it my fervent hope that you move upwards in future. Your high profile has compelled me to send this message. Keep it up sir. your excellency am proud to have u as a vice president of this lovely country of us and also as well as an old student of ghana secondary school.my only problem is i want u to use all that u could to help my brothers in bawku to get solution to the problems that is happening in bawku may ALLAH grant u the wisdom and knowlegde so that peace will return to bawku INSHA ALLAH.GOD BLESS YOU AND THE PEOPLE OF GHANA. Hi mr vice president honorable john dramani mahama,everybody is proud of your current level.We are looking to you the president of the republic GHANA. GOD BLESSED YOU AND THE N.D.C.party. Infact my vice is my role. I love this man of God too much. I congratulate you your excellency for your honorable position.Your profile is much admiring and i personally like you because i am a proud northerner(tamale)Indeed, GOD IS GOOD ALL THE TIME.Now i know that those who put there trust in the almighty shall never be disappointed.May the GOOD LORD be your guide,may he in his own wisdom help you rule the way you should.May he protect your family so you can concentrate.Do visit your people so you can tell or know there problems. YOU ARE THE NEST KING SOLOMON IN RECENT TIMES. Indeed, GOD IS GOOD ALL THE TIME.Now i know that those who put there trust in the almighty shall never be desapointed.Mr. vice President,you realy encourage me in life by your attitude.May the GOOD LORD be your guide,may he in his own wisdom help you rule the way you should.May he protect your family so you can concetrate.Do visit your people so you can tell or know there problems. YOU DESERVE WHERE YOU ARE NOW,KEEP THE GOOD WORK.GOD BLESS YOU. Your Excellercy, may the LORD OF HOST BE YOUR GUIDE. As the second vice president from the north, please help work on a practical rapid northern development NOT white paper develment. I congratulate you your excellency for your honourable position.Your profile is much admiring and i personally like you because i am a proud northerner(wa west district).I contested TEIN presidency and lost to a friend at the sunyani polytechnic chapter of TEIN-2008/2009 academic year.With you and His Excellency Professor John Evans Mills, i know the north is free from development intimidations by the southerners. I would love to be SPONSORED by YOU and your GOVERNMENT and the PARTY(NDC) to read my MASTERS DEGREE abroad after my HND ACCOUNTANCY programm towards the party's(NDC) growth. I come FROM a village call DOMANGYILE near NYOLI in the WA WEST DISTRICT of the UPPER WEST REGION. I also want to use this opportunity to appeal to you and your government to OFFER GOOD CONDITIONS OF SERVICE and JOBS to this years'NATIONAL SERVICE PERSONNELS. Thank you your Excellency once again and we are COUNTING on you for a better NORTH and a better HUMAN RESOURCE BASED. With you and other ministers of state from the north,we know the north is SAFE. I congratulate you for such an honorable position in your life time.It is the Lord,but I will urge you to take Christ seriously and always engage yourself in prayers by meditating on Gods word to build your christian life because in this world there are lots of wolf so pray all times.In addition,please try to help the youth in the country they are surfing not forgetting the National service personals who finishes their service without getting job to do. They are good resource to the country Ghana.Congratulation your profile is a good achievement.